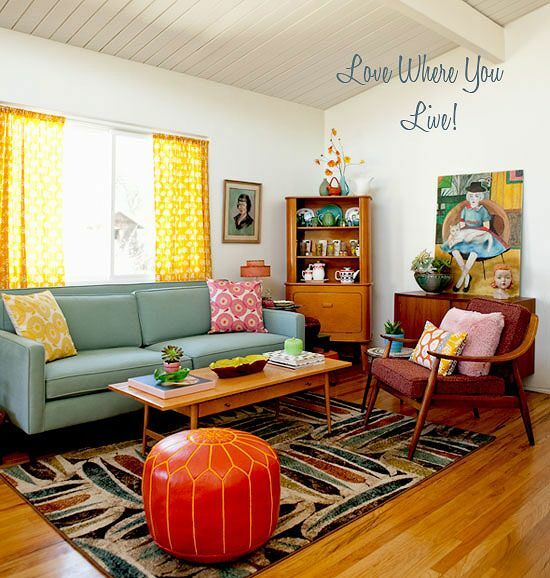 How to Make Your Home Vintage! I know you all liked my home tour post so I decided to get a bit more detailed into the vintage items and show you what you can do to make your home look and feel more vintage. 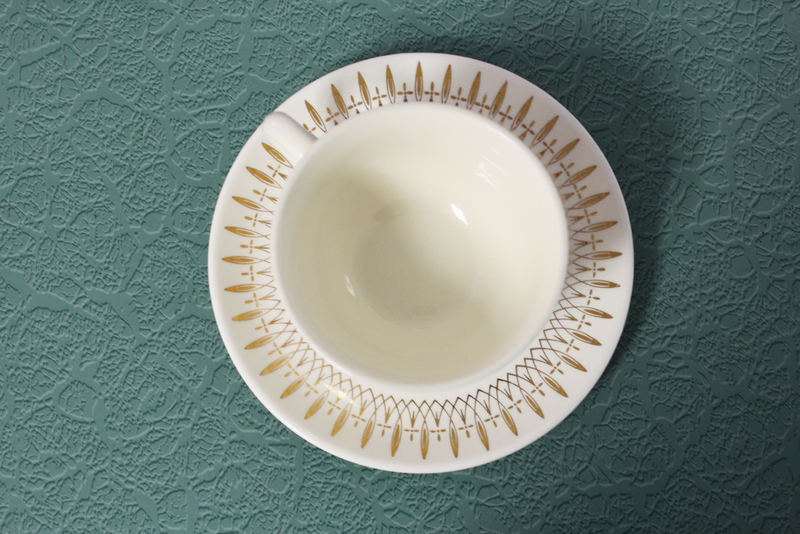 There are certain items that you can add to your home that can give you that vintage look you may be looking for. 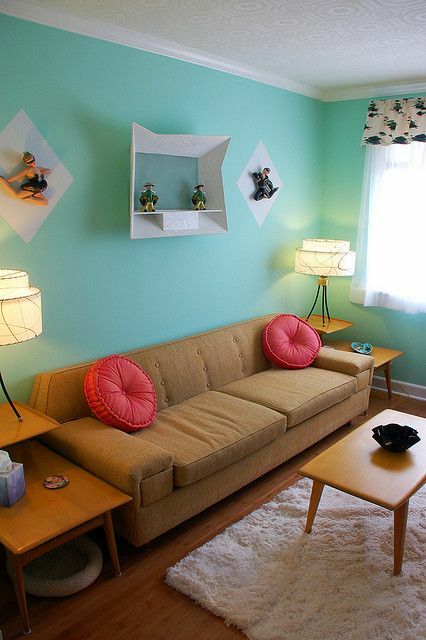 I will break it down piece by piece of items I feel can transform your living space into a comfortable vintage home. 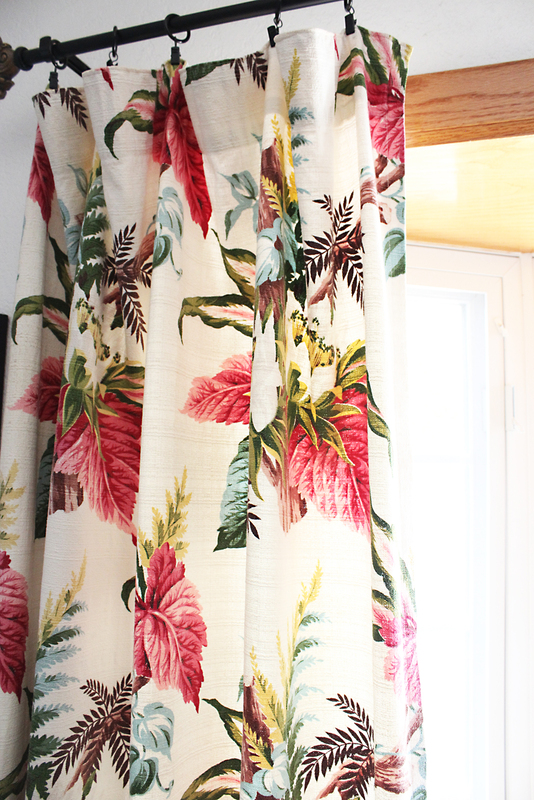 By adding barkcloth drapes to your living room, bedroom or office, you can transform the space instantly. 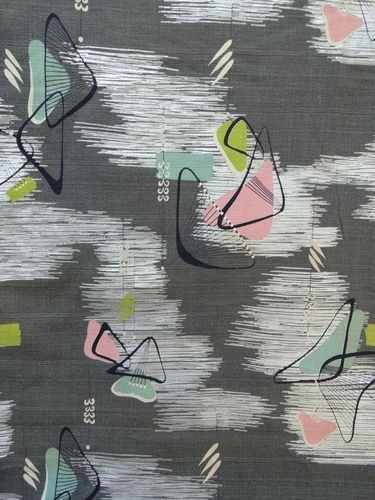 I like how barkcloth is very colorful and durable. I have some in both living rooms and my bedroom. The two panels in my living room and the two in my bedroom are all the same print and I purchased these 4 from craigslist for $120. I thought that was a great deal since there were 4 matching panels. Craigslist is a great place to look and also Etsy and Ebay. 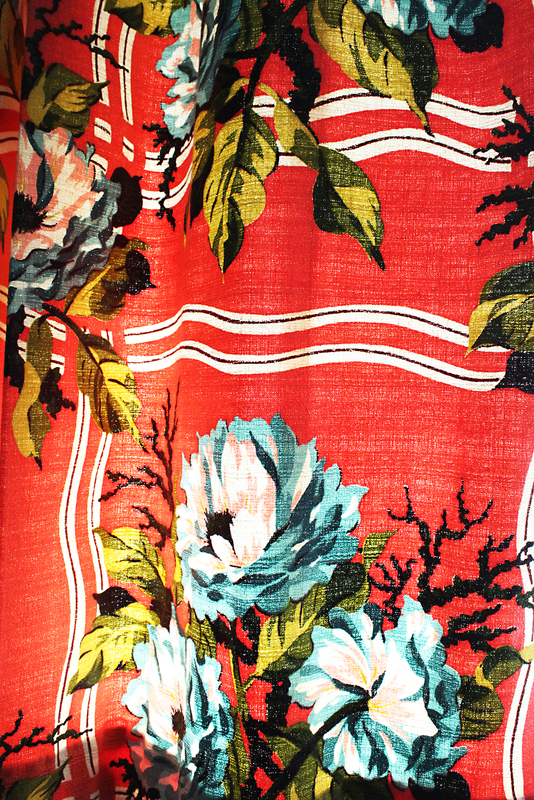 Keywords to use when you search can be barkcloth, bark cloth, barkcloth drapes, barkcloth curtains, vintage curtains, etc. 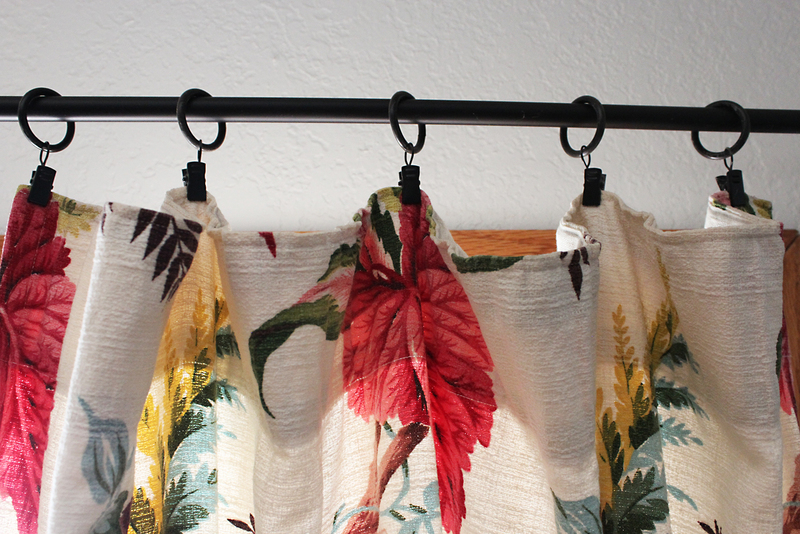 You will need to buy the curtain clips that clip to the panel and there is a circle on the top that goes through the curtain rod since most vintage curtains were not made to go through a curtain rod. You can get these at Target for about $5. 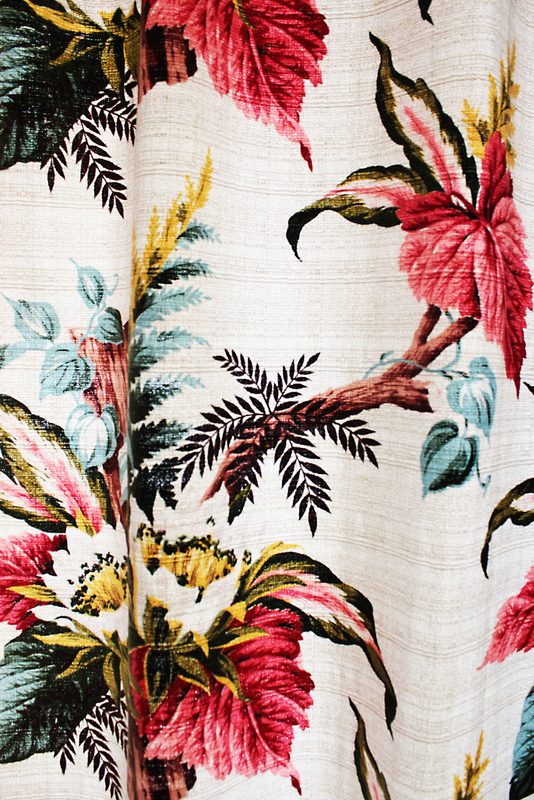 The most important thing is to have fun searching for the perfect print for your home! 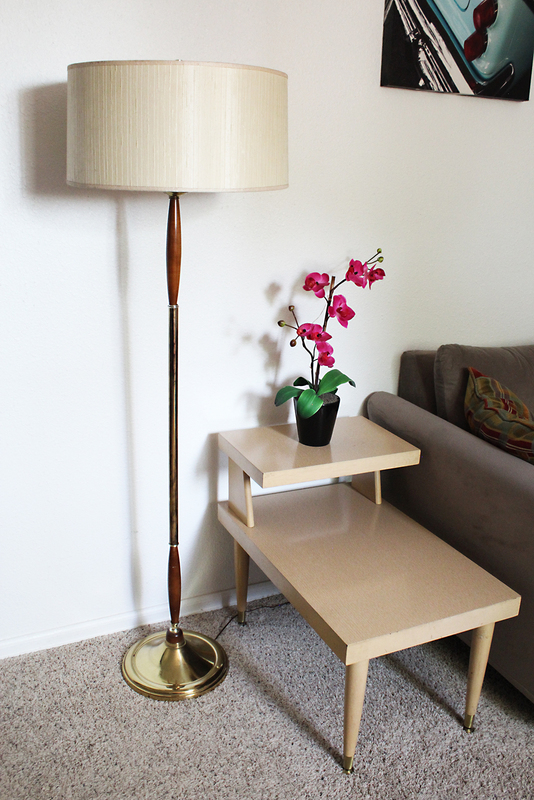 A vintage 2 tier end table is a very easy piece to find and fairly affordable depending on what you are looking for. I found this at the flea market for $5. I have the matching one upstairs. I feel these instantly make a room feel more vintage! I see them on craigslist a lot so start searching. This pair of atomic end tables are in my bedroom as night stands, they have a very cool atomic starburst on the side and I purchased from craigslist for $80. 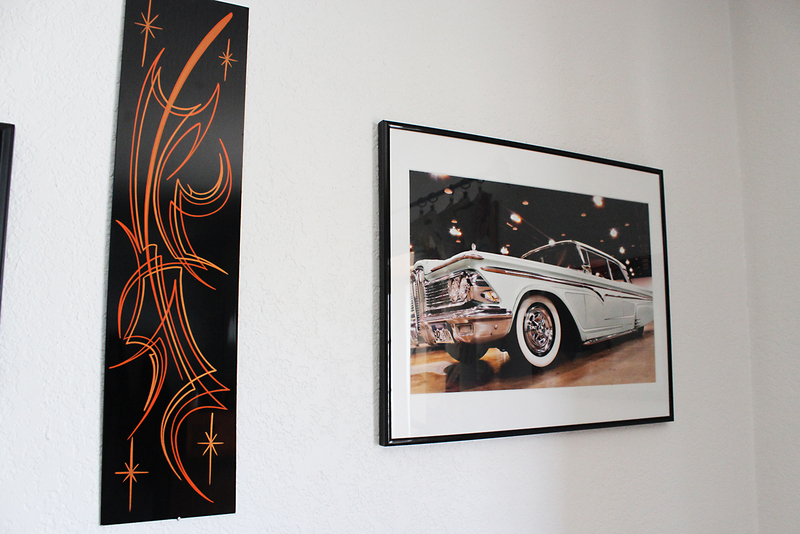 I like to decorate our walls with our own artwork, so for us, hot rod photography and pinstriping is a must! 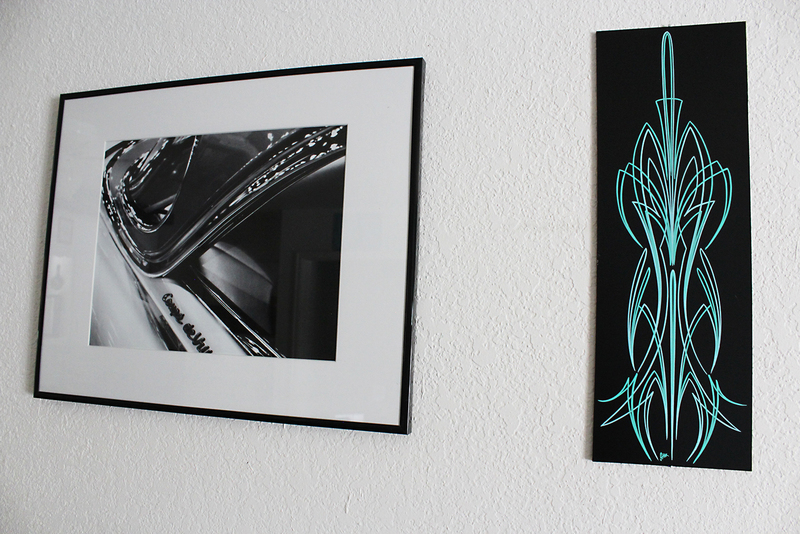 Here are a few that are hanging in our living room. Get out there and take some cool photos at car shows or purchase some photography or pinstriped panels from local artists. There are always those certain cases where they have items at stores like Hobby Lobby or TJ Maxx. Also, Etsy has a ton of prints you can purchase here, or some of my favorites are James Owens and Keith Weesner. They sell prints for purchase on their websites. These are next to the ones in the above photo in my living room. These are canvases that I purchased at TJ Maxx. Very cool addition to our second living room. Another one of my photos. 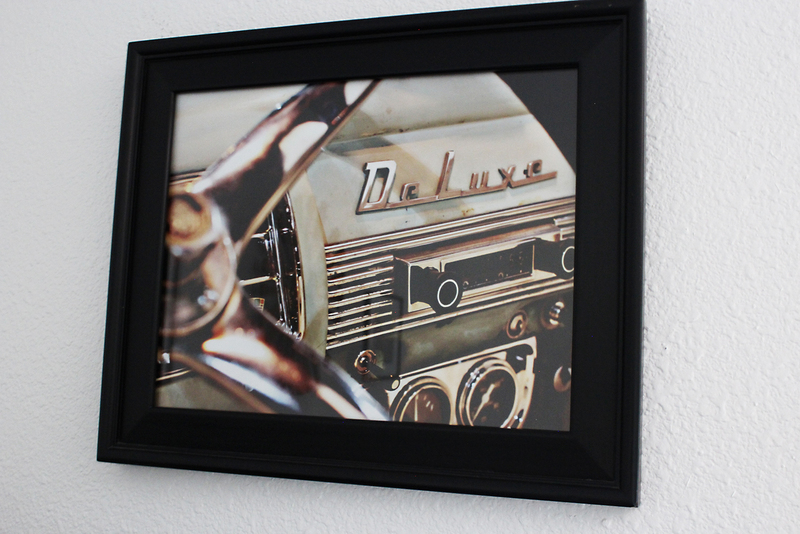 I just like how the photos bring a rockabilly feel into the vintage living space. 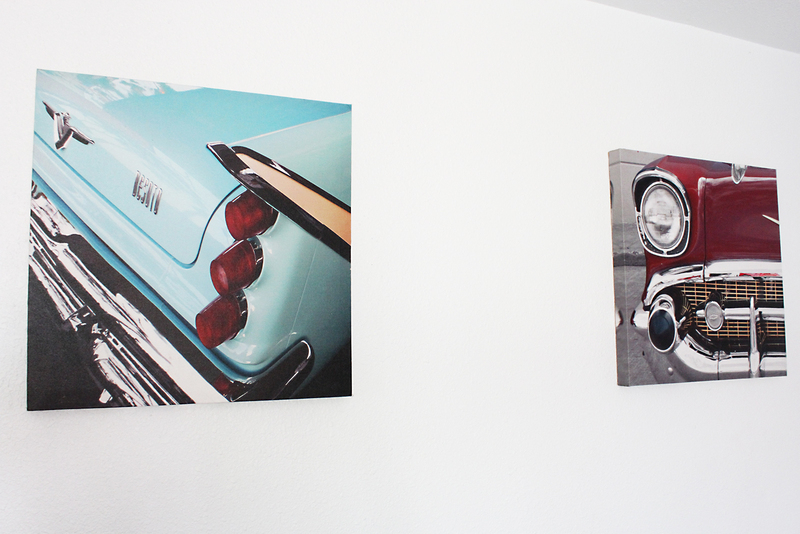 We are all about the hot rods and kustoms in our house! 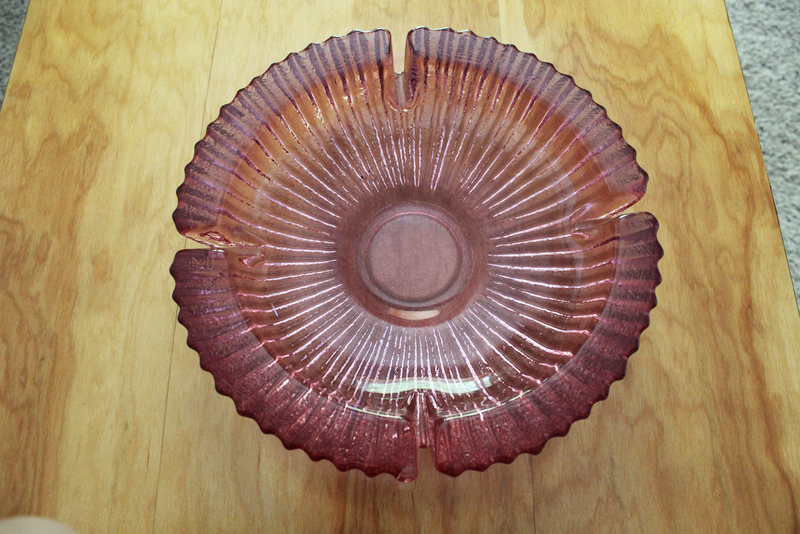 I love to collect vintage ashtrays! I like how they are all different shapes, sizes and colors. I tend to stick to the atomic ones that are usually boomerang or swirl shaped. If you place one of these on an end table or coffee table it becomes an instant conversation piece! You can find these at estate sales, antique malls, Etsy, or Ebay. Keyword searches can be atomic ashtray, vintage ashtray, 1950’s ashtray, etc. I use the bigger ones I have as a key tray so we always know where the keys are. 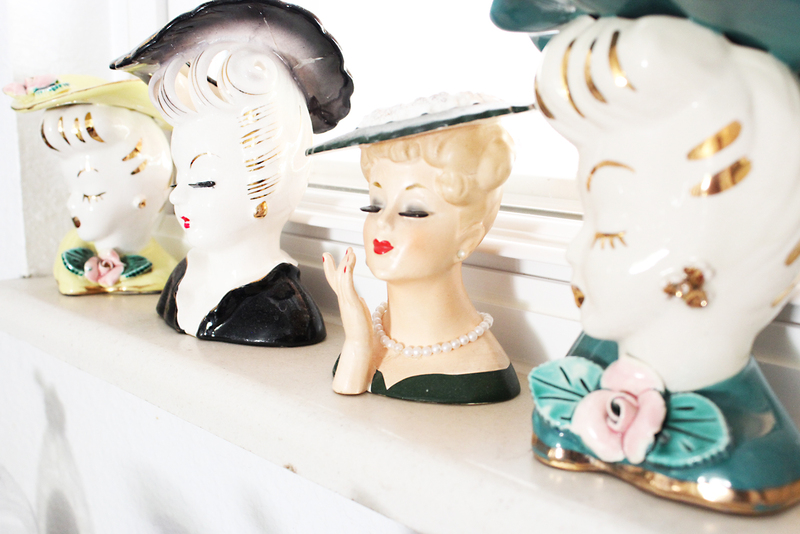 I like to collect lady head vases and display them through out the house. I have these on my window sill above my kitchen sink. I like to look at them in the rooms I spend the most time, my kitchen, office and Cherry’s room. You can find these on Ebay and Etsy. This is where I like to purchase them because you can find great deals. I tend to like the head vases that look more “50’s to early 60’s”, with the full pompadour, eyes closed, small gold accents, great lips and a hat! I found these wall hangings on a Facebook group. I have never seen any like this before and I instantly fell in love with them! They are hanging above my desk in my office. 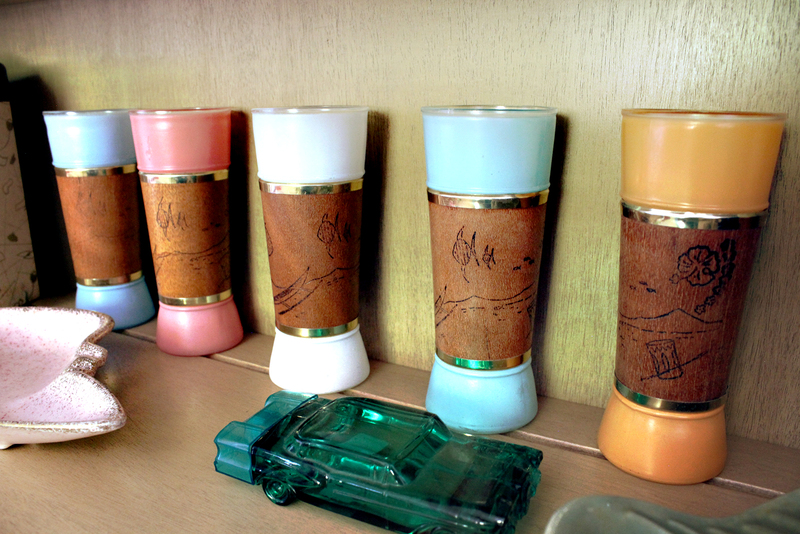 Vintage glassware is a must have in any vintage home. The great thing about glassware is that it is very easy to find unique pieces and it is a good place to start collecting since it is a smaller item. When searching for glassware, I happen to stumble upon the sets I have, I have never went out looking for anything specific. 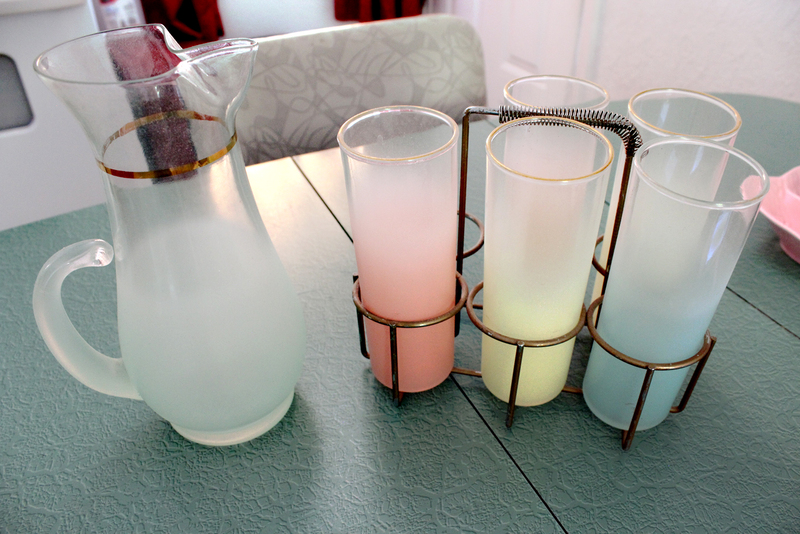 This 60’s Blendo glass set with matching pitcher has a very pretty fade of frosted color. It also has a gold metal holder to easily transport all 6 glasses at once. Unfortunately I only have 5 because I broke one in the garage, that was the end of these going outside. I believe I picked these up at an antique mall for under $10. You can see some here. These are my favorites! I had these in our tiki bar until we recently had to get rid of it. They are Siestaware multi colored glasses that have a wood wrap on them with small Hawaiian inspired designs, fish, hibiscus flowers, etc. I also picked these up at a local antique mall but you can get them on Etsy and Ebay as well. 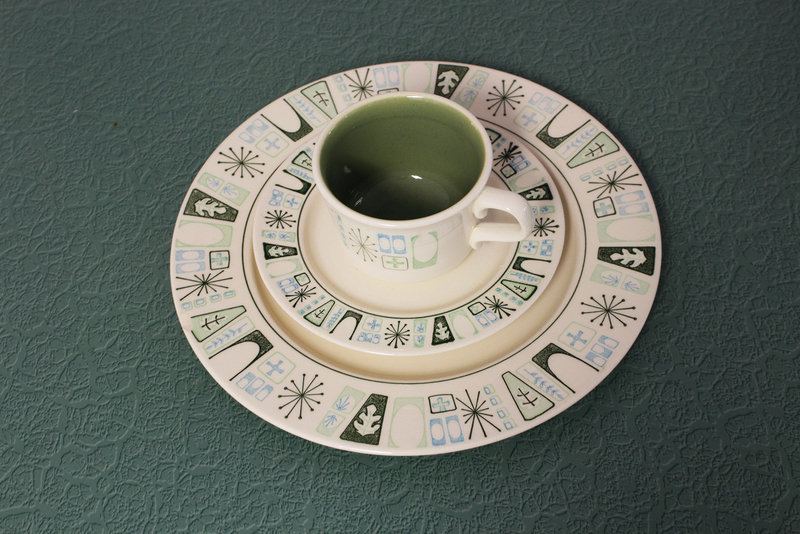 Vintage dish sets can be pricey unless you find them at a great deal and to find a whole set is another question. 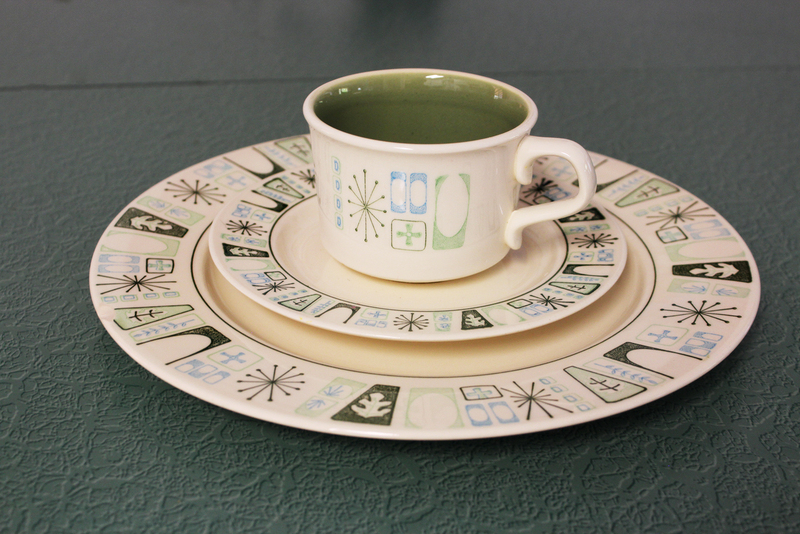 I was at an estate sale when I found part of this set, a dinner plate, 3 cups and 5 saucers. I got it all for $5, it was a no brainer. I need to continue to purchase the rest of the set to complete mine. I like the atomic starburst designs and the retro feel the set has as a whole. I found a lot of it on Etsy you can find this set here, it is called Taylor Smith Taylor Atomic “Cathay”. 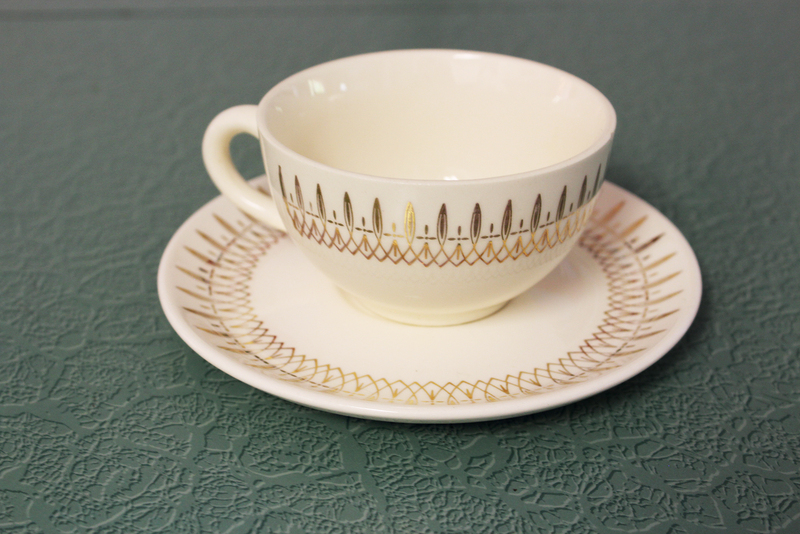 I like to add dishes here and there and these very cute cups and saucers happend to be at the flea market a few years ago and I was able to get 4 cups and matching saucers for $2. As you can see, you just have to be on the hunt to find the deals! I like the gold design on this set. 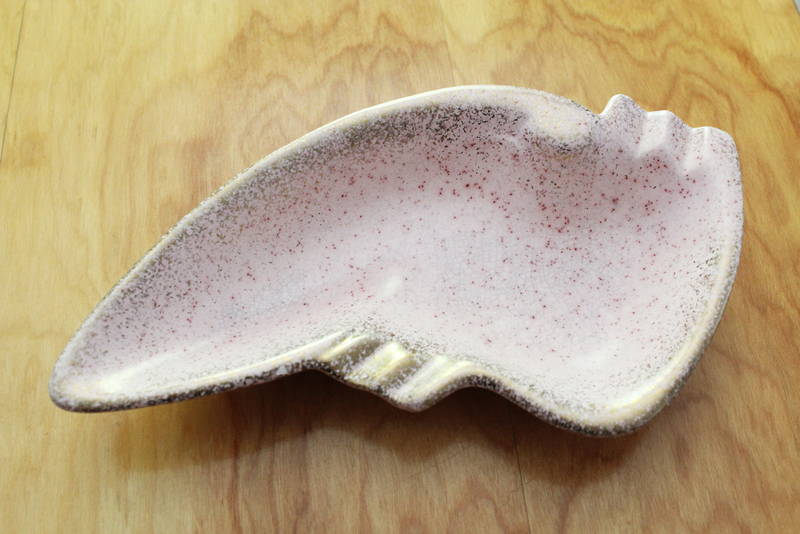 The pink dishes above are some of my favorite small dishes! 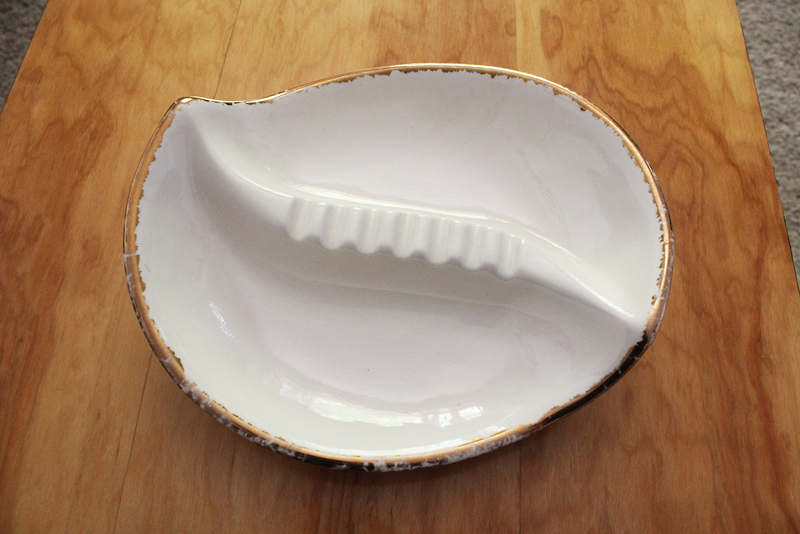 I really like dishes that are different shapes and have small details. 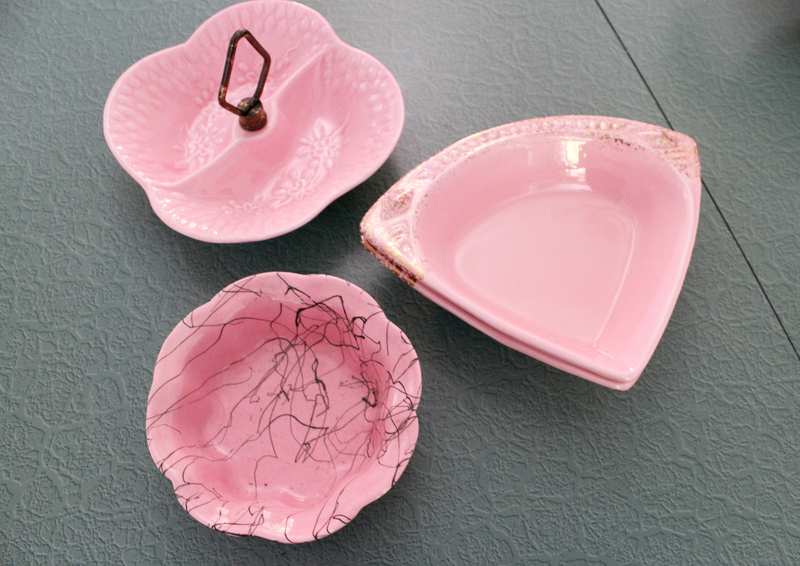 The pink dishes are usually from California pottery companies, you can see some here. 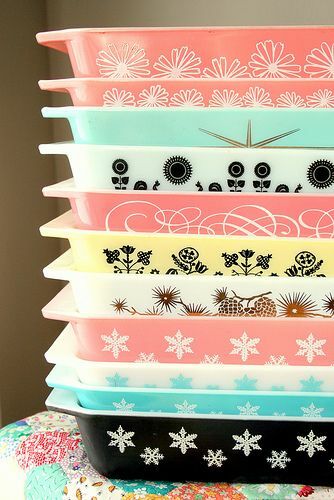 Vintage Pyrex is the best place to start when adding items to your vintage dishes for your kitchen. There are so many different types, colors and styles. You can find them in thrift stores, garage sales, estate sales, craigslist, Etsy & Ebay. 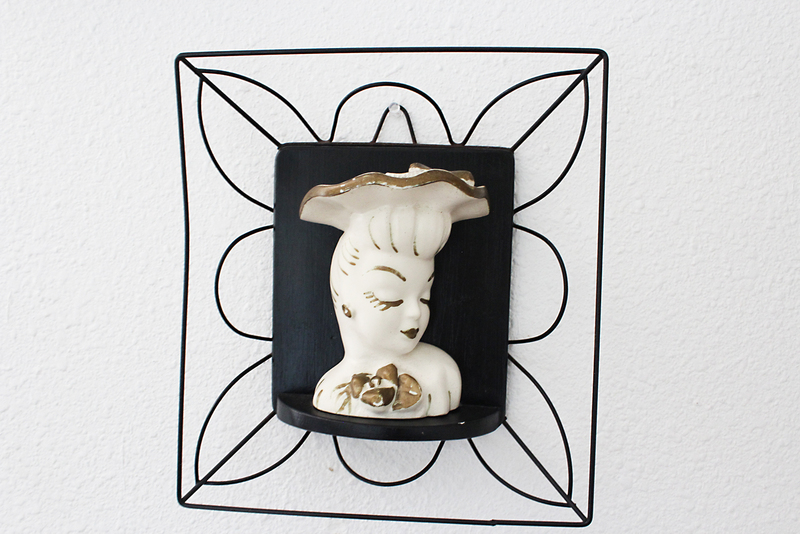 They are very inexpensive and can add a cute bit of decor to your kitchen! 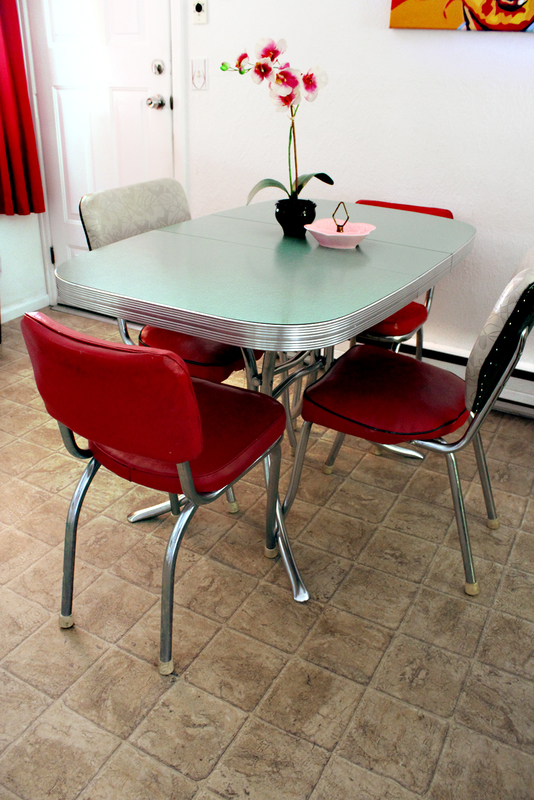 A vintage formica table is a great place to start your vintage kitchen. You can find them on craigslist for great deals and they are usually negotiable. I had in mind the style of table and color of formica that I wanted and it had to be true vintage not reproduction. I wanted the legs to come from underneath the middle of the table and curve down, it had to be oval shaped and mint green formica. With all of those requirements I was searching for quite some time, about a couple of years. I finally found one locally, in my price range ($180) and it was perfect! Previous to this one we had a white cracked ice formica table. It is now in Stan’s Stripers Lounge and he uses it as his work table. 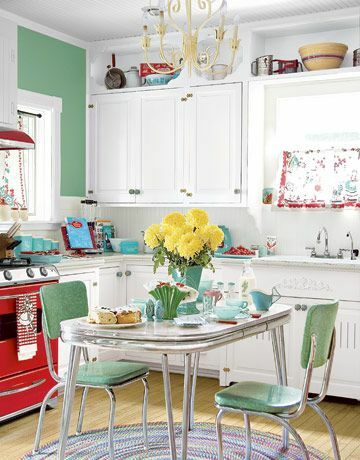 When searching for a vintage kitchen table you can use search words such as, vintage table, vintage kichen table, diner, diner table, formica, etc. Have fun hunting! When selecting pieces to go into your vintage home, keep in mind the color scheme you are going for and for what room the piece will be. 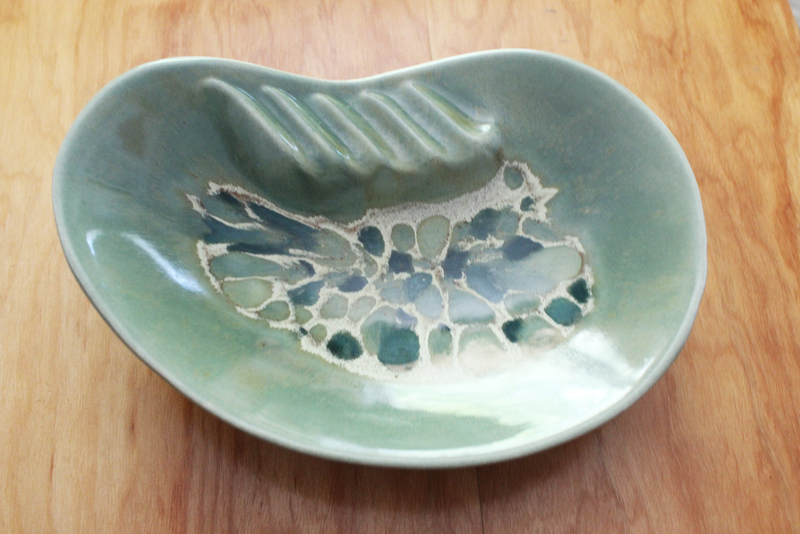 I tend to stick with more atomic inspired pieces and I like mint greens, reds, corals, and pinks. 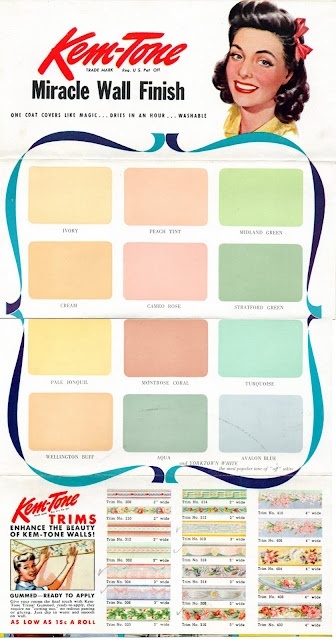 These are the colors I usually lean towards when picking out items for the house. 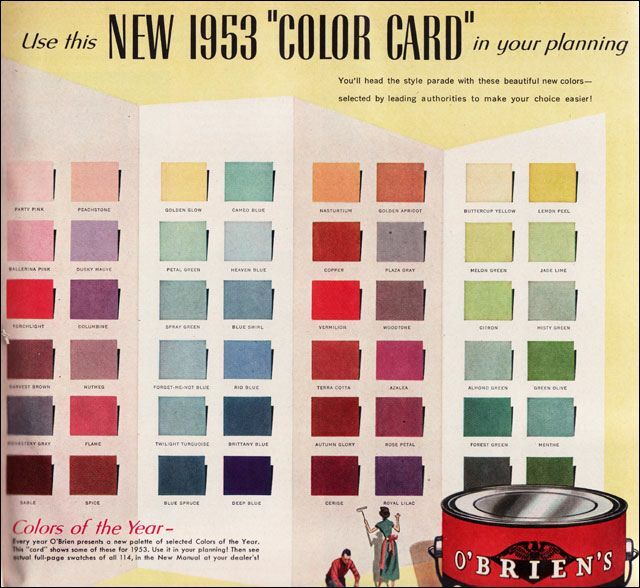 Here are some color cards from the 50’s that may give you some inspiration. 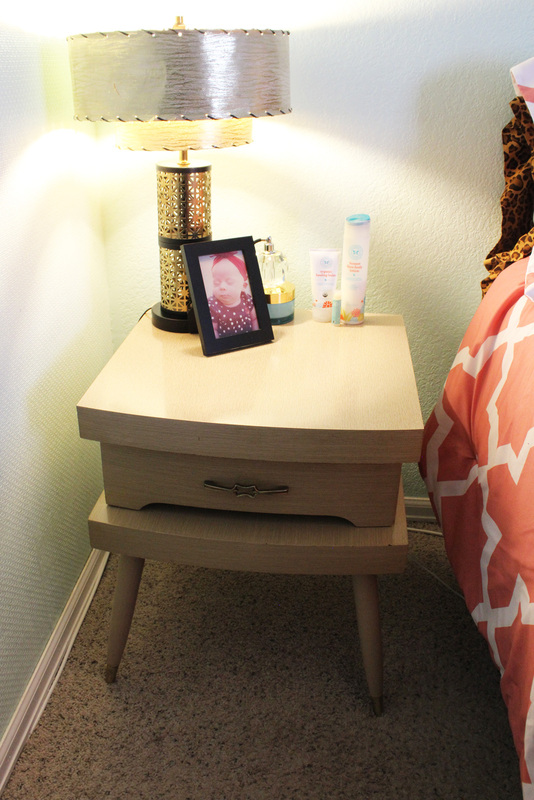 To get inspiration and ideas on how you want to decorate your home look on Pinterest! 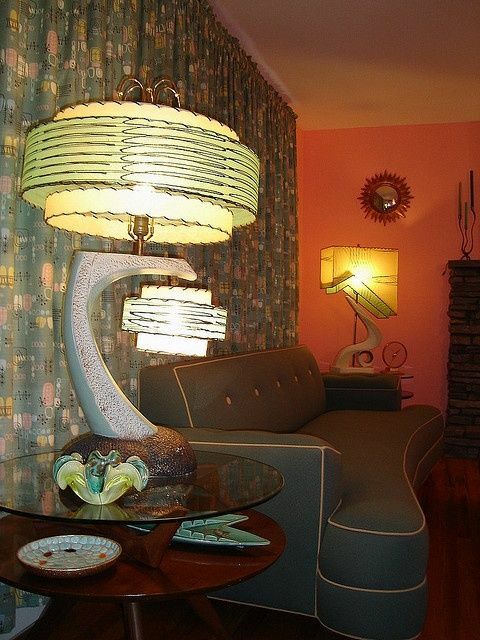 They have amazing decor ideas for vintage homes. Check out my board called the Rockabilly Dream here and all of my other boards here. I hope you enjoyed this post. 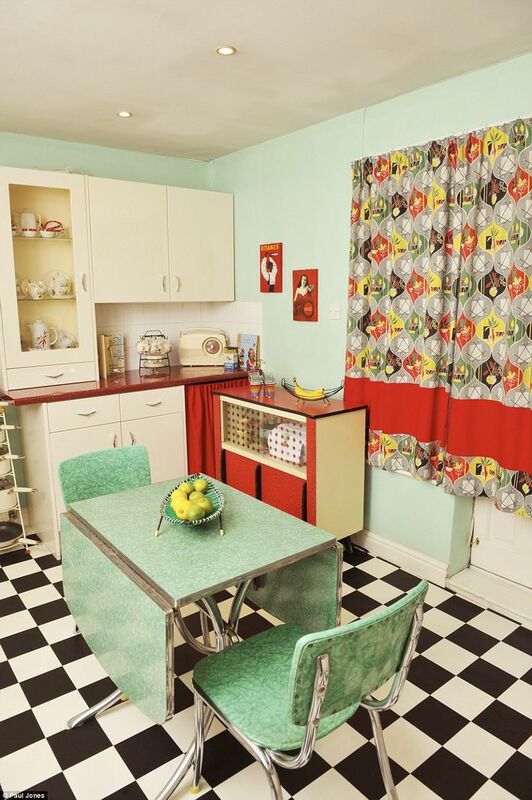 Good luck in creating your own vintage home!